nammAzhwAr explains the glories of emperumAn who is being approached. Subsequently, nammAzhwAr explains the distinct nature of emperumAn who is worshipped after giving up worldly attachments. nammAzhwAr explains the most enjoyable nature of emperumAn who is approached which is contrary to the not-so enjoyable nature and defective nature of worldly pleasures which are given up. bhagavAn is distinct from chith (sentients) which are unchanging by nature and achith (insentients) which constantly change into different forms. So, after giving up attachment towards other aspects, approach with devotion, such bhagavAn who is filled with bliss. As “pullu” indicates abundance of friendliness, it highlights the loving nature of this devotion. If some one says “we can pursue bhagavAn only if he is distinct and more glorious than the worldly pleasures that are to be given up”, AzhwAr explains to them that bhagavAn is devoid of any defects, filled with all auspicious qualities, being distinct from chith and achith and because of all of these, he is most enjoyable. Thus, give up attachment to these faulty aspects and approach him. illathum – non-existing – It is not said as non-existing because of lack pramANam (authentic explanation) of achith or not because of achith being an illusory aspect (as explained by adhvaitha/mAyAvAdha philosophers). It is due to the fact that achith is perishable (has total transformation of itself), it is said as “illathu“. uLLathum – existing – due to the distinction from “illathu“, i.e., chith does not change itself ever, it is called “uLLathu“. 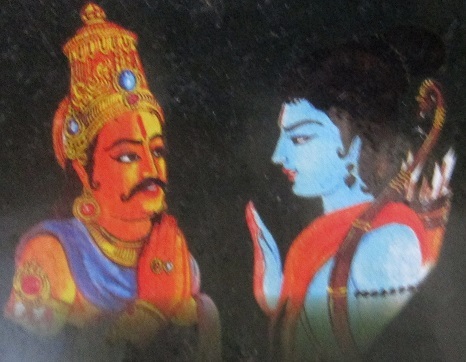 illathum uLLathum – chith and achith are explained as sath and asath in srIvishNu purANam “yadhasthi yannAsthi” (existing and non-existing) and thaiththiriya upanishadh “sathyanchcha anruthancha” (truth and false). It can also be explained as achith which is the abode of AthmA and AthmA which resides in achith – in this context “ill” in thamizh is explained as house and “uL” is explained as “that which is inside”. allathu avanuru – his nature is different from achith which is perishable and AthmA which becomes bound in achith (body) and considers “I am enjoying, I am suffering, etc”. ellaiyil annalam – Many pramANams are highlighted to explain bhagavAn‘s blissful nature. He is explained as such in thaiththiriya upanishath “Anandhamaya:” (filled with bliss), thiruvAimozhi 1.1.2 “uNar muzhu nalam” (filled with gyAnam and Anandham), srIvishNu purANam 6.5.84 “samasthakalyANaguNAthmakOsau” (naturally having all auspicious qualities), etc. pulgu – For one who is fully knows the auspicious qualities, bhagavAn who is filled with such auspicious qualities is most enjoyable, similar to embracing a beautiful woman for some one who is desiring worldly pleasure. paRRu aRRE – One should give up other attachments and then pursue emperumAn. One cannot be “iru karaiyan” – i.e., one who holds on to both vishayAntharam (worldly pleasures) and bhagavath vishayam (devotion towards bhagavAn). As explained in thiruvAimozhi 7.2.7, “paRRilAr paRRa ninRAnE“, bhagavAn is pursued by the ones who have given up all attachments to vishayAntharam (worldly pleasures) and sAdhanAntharam (other means to attain him). This entry was posted in thiruvAimozhi, thiruvAimozhi 1st centum on May 15, 2015 by Sarathy Thothathri. Thank you very much for the vyakhyana translation of the above delightful paasuram. In very last point, as per highlights from Nampillai Vyakhyanam, devareer has written that -> ‘One should give up other attachments and then pursue emperumAn. One cannot be “iru karaiyan” ‘. adiyen has heard one Ithikyam where in there is a discussion between Koorathazhwan and Mudaliyandan on whether one should pursue Emperuman after completely giving up worldly attachments or as we develop taste and ruchi for Bhagavad Vishayam, worldly attachments would start reducing automatically. In this, Koorathazhwan was of opinion that one should totally give up worldly desires and then approach Bhagavan wholeheartedly whereas Mudaliyandan was of the latter opinion. Mudaliyandan argued that the former path as told by Azhwan was very very difficult and was only possible by Big Mahans like Azhwan only. Whereas for general people like us who are immersed in worldly desires since time immemorial , the latter path is only possible. Then Azhwan also agreed to Mudaliyandan’s explanation. Swamy, as per above ithikyam, does Nammazhwar ask to completely give up all attachments and then approach Emperumaan or try developing prathipatti towards Emperumaan sincerely, thereby reducing the attachments worldly? AzhwAn/ANdAn aidhihyam is very much valid. But here nampiLLai is explaining based on the context of the pAsuram. There are several instances like this where a specific aspect is highlighted in context of the pAsuram. And, philosophically, this is the apt view (sarva dharmAn parithyajya mAm Ekam saraNam vraja) – that one should give up everything and approach emperumAn – but practically only the reverse (mARpAl manam suzhippa mangaiyar thOL kaivittu) may be possible for common persons like us as indicated in AzhwAn/ANdAn incident – both aspect have adequate pramANams.